Whether it’s a toddler refusing to go bed or a teen who wants to play one more game, many parents are struggling to figure out why their child is at odds with going to sleep. Nightly routines or sleep disorders could be the cause of battles at bedtime. However, many experts cite an increase of screen time and its impact on how kids go to bed. It’s no surprise that sleep is a major factor in how people of all ages are able to function on a daily basis. There have been countless studies and chatter among medical experts about the effects of insomnia or little sleep in adults. However, for kids, getting enough rest is just as important. According to the 2016 American Academy of Pediatrics report “Childhood Sleep Guidelines,” adequate sleep duration for age on a regular basis leads to improved attention, behavior, learning, memory, emotional regulation, quality of life, and mental and physical health. Not getting enough sleep each night is associated with an increase in injuries, hypertension, obesity and depression, especially for teens who may experience increased risk of self-harm or suicidal thoughts. Kids who consistently do not get enough sleep can miss or be late to school, have mood disturbances, or a decline in school performance, says Dr. Sally Ibrahim, a psychologist at Cleveland Clinic’s Sleep Disorders Center. Parents who are worried about sleep issues that are not typical should talk to their pediatrician or a sleep specialist, according to Ibrahim. “They can have a comprehensive review of their child’s sleep patterns,” she says, adding children do get sleep apnea and other sleep disorders. In fact, getting a good night’s rest is not only on the mind of health experts, but also school officials. Currently, officials at Mason City Schools in Ohio are evaluating if they should start later in the 2019-20 school year due to this issue. According to the U.S. Center for Disease Control and Prevention’s 2014 School Health Policies and Practices study, 93 percent of high schools and 83 percent of middle schools in the U.S. started before 8:30 a.m. While the AAP recommended in 2014 that schools start later (after 8:30 a.m.) due to insufficient sleep concerns for students, and in 2015 U.S. Centers for Disease Control and Prevention reaffirmed that statement, most U.S. schools still start early. An October 2018 survey polling 240 sixth, seventh and eighth graders at Denver Public Schools asked if U.S. schools should change to a later start time. Of the 132 respondents, most students liked the idea because they wanted more sleep, but also more time to spend on homework. “I think it would help because I normally get home very late from school and have to stay up later to finish homework, which prevents me from going to bed at an earlier time and getting more sleep,” one student said. Others wondered if the school day would then end later, which leaves them little time for school work and after school commitments. “If you start later, then you end later, and then everything after school would be different and you would have to change it, so you might have to stop doing certain things,” one student said. 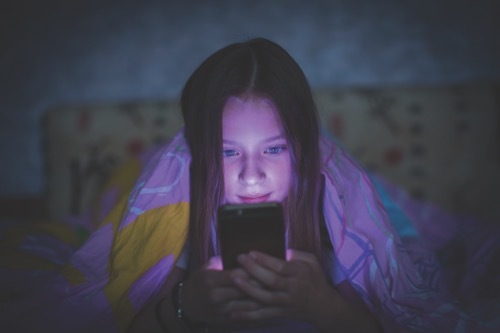 To truly get enough sleep, however, kids have to put away their smart devices. Terry Cralle, a nurse and certified clinical sleep educator from the Better Sleep Council in Washington D.C., says the blue light of the screen triggers alertness. In the online survey of middle school students in Denver Public Schools, 30 percent said their devices are turned off and stored away in a designated area by 9 p.m., and 12 percent by 10 p.m. Twenty-one percent of students are not allowed to have a device in their room. However, another 35 percent said they currently do not have household rules before bedtime. Shutting down the screen is one way to help encourage sleep, but parents have to combine that effort with a proper sleep-focused bedtime. She recommends non-alerting family activities before bedtime; not punishing kids by having them go to bed early or giving them a reward of staying up late; and setting the mood by dimming the house lights. Cralle says creating technology rules has to be non-negotiable.